Anhui Masteel Engineering & Technology Group will operate, first in China, a complete solution for no-man operations on the casting floor. The robotized solution will be implemented on the two-strand Danieli conticaster for heavy beam-blank sections (the largest of which measures 1300x510x140 mm and has a metric weight of almost 2,700 kg/m). Q-Robot Cast Ladle is a multifunction robotic system to allow fully automatic operations in the ladle area: shroud manipulation and handling, temperature and chemical physical sampling, emergency lancing with the option for the tundish powder feeding. With Q-Robot CAST LADLE, men are no longer physically involved in dangerous activities on the casting floor area, improving the level of safety, and minimizing operator’s involvement in recurrent time consuming and risky tasks. Q-Robot guarantees automatic detection of the ladle nozzle position and adaption of the interchangeable part of the lance to any type of cartridge. Compact dimensions and optimal visibility on the ladle area during robot operation are additional benefits. The Robot is easy to reconfigure for changes made to the plant and maintenance costs and timings. The achieved flexibility brings the entire process to higher automation levels improving the process efficiency. Our integrated robotic cell is composed by a 6-axis anthropomorphic robot - devoted to sampling and emergency lancing, ready also for expansion to powder option thanks to an automatic quick tool change device - that works in cooperation with a servo operated auxiliary manipulator for shroud handling and automatic cleaning: the cell is autonomously supervised by its own control system and driven by an HMI console fully integrated with Level 2 automation system and compliant with Industry 4.0 protocols. Automatic cartridge dispensers, auxiliary racks for consumables and ancillary tools complete the whole system. Before signing the contract, Masteel has fully analyzed the application scheme of the robot for the Ladle in China for almost half of year. Various stages were discussed in detail. 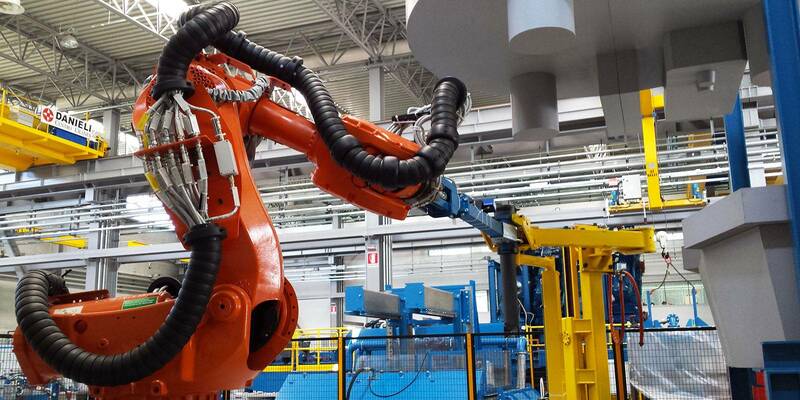 After seeing it perform in the ABS factory in Italy, it became clear that its functions can be fully merged with the operation cycles and manufacturing processes. Prior to the implementation and with aim to meet the customer’s specific needs, Danieli Research Center developed an improved version of the auxiliary arm scheme. It’s no surprise that that led to positive feedback. In fact, MaSteel pointed out that this robot is the is the most advanced and reliable solution in the world for the application of the same kind of Ladle robots. The system will be entirely realized within the next eight months; commissioning and entering into service is planned by September 2019.